Ear Institutes are managed hearing, healthcare service providers with 20 institutes situated throughout South Africa and Namibia. Their aim is to deliver the best possible hearing healthcare service, coupled with an enjoyable experience in world class facilities. Their multi-professional teams work in close collaboration with other medical professions, ensuring the best possible diagnosis, advice and treatment for all their patients. The client brief stipulated a contemporary building, simple and clean in form, which would efficiently accommodate the various functions of an Ear Institute, whilst maintaining a sense of space and comfort for the patients. Thus, a building sculpted from cubic volumes, with a superior all-embracing concrete frame over the main waiting area, was conceived. 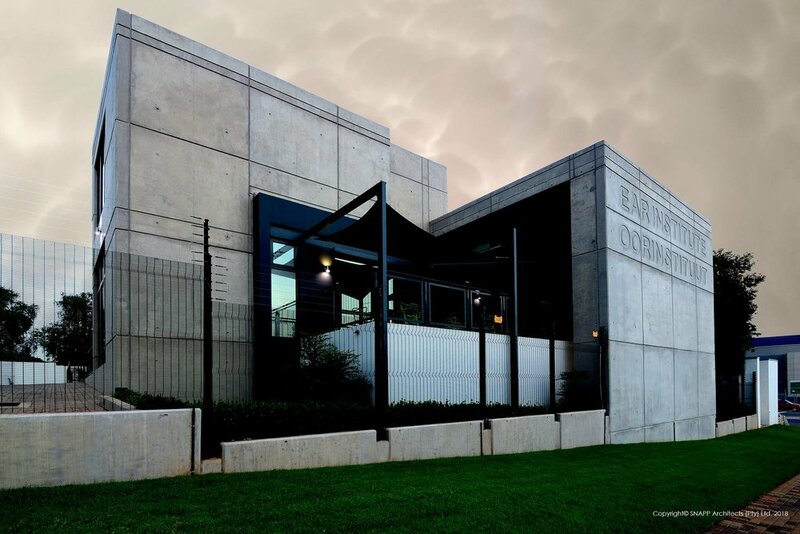 Located at a prominent intersection along the busy Lynnwood Road the key considerations when designing the Lynnwood Ear Institute building were always going to be visibility of the building from the street and conversely, privacy, calm and quiet within. The site restrictions demanded that only moderate sized, single story building with basement below, could be developed. The challenge was to design a prominent building, whilst remaining respectful of the site constraints and adjacent residential neighbourhood. The approach is dominated by a glazed façade, in order to take full advantage of the soft southern light. A broad, welcoming staircase and ramp, guides one to the entrance. Light is drawn into the interior spaces through the inclusion of clerestory windows below an elevated roof, which wraps down to street level, creating a feature wall and anchors the overarching frame. The reception, waiting and coffee areas are centralized to facilitate circulation. Consulting rooms are largely located along the northern side of the building with large windows protected from the heat and glare of the sun by means of a continuous filigree screen. All appropriate windows are acoustically treated. The pediatric section has dedicated play space for the children. The clerestory windows have remote mechanical opening systems to allow hot air to escape from the higher volumes; thus creating a cool, quiet interior in contrast to its bustling urban setting. Entry to the property is controlled by booms and a manned guardhouse. The basement makes provision for twenty vehicles. Access to reception from the basement is via elevator or stairs. There is additional uncovered parking for ten cars. Feedback from the client, staff, patients and the general public has been extremely complimentary. On this basis, we consider that the brief has been successfully achieved and implemented.